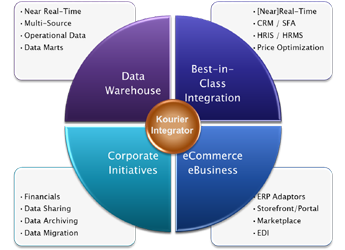 Kourier Integrator is a multi-purpose enterprise integration and data management solution, With Kourier Integrator best-in-class applications can be seamlessly integrated and operate as though they were an integral part of your MultiValue application. This ensures data consistency while eliminating costly and redundant data entry. Your enterprise will become more efficient and productive, saving you time and money. Below you will find examples of software applications for which we have integration experience, or have created a data warehouse or operational data store (ODS). Call us if your application is not listed, there's a good chance we have worked with it. Kourier Integrator can help you build a consolidated enterprise data warehouse from multiple databases and data sources, and we have many pre-defined operational data stores. Here are examples of the more popular commercial U2 applications we have worked with to create an enterprise data warehouse using Kourier Integrator and SQL Accelerator. Here are examples of some popular third-party applications that have been integrated using Kourier Integrator. Contact us if you don't see your application on this list.